Our enterprise is involved in manufacturing a wide range of kitchenware and cooking ware such as Silver Plated Tray. Tray is a flat plate made of metal, alloys or non-metal. This flat plate is used to carry dry, cooked or processed food in household as well as domestic kitchens. Moreover, modern trays are available with various printed and stylish design to add extra beauty in kitchens. Our plates and trays are appreciated all over the world due to the features like light weight, stylish print and long functional life. Our enterprise has been involved in manufacturing and trading a wide range of kitchenware and gift sets such as Gold Plated Tray. 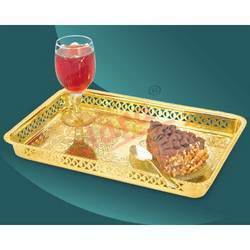 These are widely used for serving food and soft drinks to the guests. Trays and plates are made of various materials such as steel, fiber, plastic and glass. Usually trays are available in various shapes like rectangular, square, round and hyperbolic. 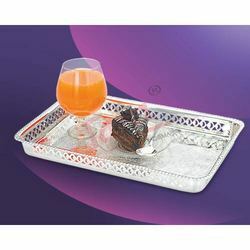 In present days, utensil manufacturers make trays with attractive print designs to suit the tastes of the customers. Looking for Decorative Trays ?